Glycerin is a friend and a foe. In one breath it can be praised but in the next it can be cursed. So here are a few quick facts about glycerin. 1. It is a humectant which means it can hold onto water (3 molecules of water to be precise). 2. It is moisturising i.e it helps maintain or increase water levels of hair. 3. Natural hair treated with glycerin is resistant to premature breakage. This means the hair will break but not as much at low levels of force. Relaxed hair does not benefit from this property (J Soc Cosmet Chem, pg 39-52, 1985). Why is glycerin so hard to use? Glycerin is usually quite effective at high levels. High means 20-25% mixed with water (1 part glycerin to 3 or 4 parts water). However this mix tends to feel sticky to the touch. As the scientists say, 'it lacks cosmetic elegance'. Therefore glycerin is normally changed to very low concentrations (between 2 and 10%) and mixed with additional ingredients such as oil. Glycerin IS a very effective moisturising ingredient, there is even an entire book dedicated to it. If you need to troubleshoot your glycerin use, consider these tips. 1. Do not use straight glycerin, always combine it with water. Start at around 25% (1 part glycerin to 3 parts water) and keep increasing the water until you find a level you like. 2. Glycerin can feel sticky. Try using a small amount in a spray bottle. Do not thoroughly wet the the hair, just a few short sprays. 3. Glycerin is easily washed off. If you don't like a particular concentration, get rid of it by wetting your hair or washing it. 4. Does your hair feel mushy after using glycerin? It may be because your hair is moisturised enough or you have applied too much product. What do you think of the theory that humectants, glycerin in particular can pull moisture from hair when there is no moisture to be drawn from cold, dry winter air? Great Q MrsT. I think that pure glycerol can do this. Glycerol is thick and gluey and usually sold for lab or research use. The product most of us purchase is glycerin which has some water content. Additionally, glycerin really should be used in dilute form. It takes a lot of energy to remove water from glycerin. Scientifically, the reason why glycerin takes up water is to make it more stable. Therefore it doesn't make chemical sense for it to give up the water. Consequently if the glycerin is appropriately diluted, I do not think that the scenario you described as being probable at all. I do understand that people have reported this but I'm really at a loss to explain the observation. There is definitely the possiblity that the glycerin mixture needs tweaking even if it is a commercial product. As always hair is in balance with moisture in the air and therefore what works in summer may not do so well in winter and vice versa. So once the glycerin is diluted, the water molecules are already attached and from there it is unlikely the glycerin and water will seperate. So it wouldn't be necessary for the glycerin to draw more water from the hair. Is that right?I think I've always read that glycerin attracts moisture from the air (humidity), not that once it's been mixed with water it already has attracted all the water it can hold. Very interesting. Yes MrsT - once glycerin is mixed with water (sufficient water that is), it is saturated. Thanks again for the question! Mrs T - your comments and JC's responses really connected the dots for me. I'm so glad to fully "understand" glycerine! My mix is about 15% glycerine in water. I started by filling a small spray bottle a quarter of the way up with glycerine and the rest with water. It was too sticky and that's how I got from 25% down to about 15. JC - Does the moisture attached to glycerine need to be "sealed". If so, would adding olive or jojoba oil to the mix be beneficial? i'm sorry if you already answered this but i just want to be 100% clear and not come to the wrong conclusion. Jc are you saying that glycerin does not have to attract water from the air once it is already saturated with enough water? so it does not matter so much whether you use it in dry or humid weather? Anon - yes you can use oil to help glycerin keep the moisture level. I will write a conclusion post on this series which will have a paper referencing a mix of glycerin and jojoba. Sky - Thanks for asking your question! I am indeed saying that once glycerin is saturated with water, it cannot hold any more water and therefore wouldn't attract water from the air. Separating water from glycerin is the subject of continual research and the methods used can be quite aggressive like strong heating, use of acids, use of enzymes etc. I think if it was as simple as leave the glycerin outside on a dry day, it wouldn't still be researched! thank for responding jc! one more question, are you also saying that relaxed hair does not benefit from using glycerin & water? Relaxed hair may benefit from the moisturising effect of glycerin. It wouldn't benefit from the 'strengthening' effect of glycerin. I say strengthening for lack of a better word. Thank you for this...I was wondering whether I needed to give up using glycerin as a spritz because my mix (25-75) was so sticky feeling. I will add more water and try again. Thank you So much for addressing this quesiton about not being able to use glycerin in winter months. I have heard this so often and never saw how that could be 100% true? Also, I know when curly perms aka Jeri curls were in, a lot of used glycerin products all year round and they hair never appeared to dry out? So mixing it with enoug water must be the key..and most of those products have water as the first ingredient. You're awesome! I really appreciated these posts and comments on glycerin because I've been using a homemade vegetable glycerin and water mixture since my BC (fully natural for 3 years now). My first year, I used it all-year-long. Since I started to "hear" that it wasn't good to use in the winter time because people were having a "negative effect", I shared that with others. I figured since others were sharing their experiences with me, I would pass it on meaning no harm. My very first mixture was half and half, but I didn't like how sticky it was. So someone told me to try 3 parts vegetable glycerin to 5 parts distilled/filtered water (I have very hard water) and I liked that formulation [I still might tweak it again because of this post, but I'm still reading or as I like to think of it as "researching" with a lot (all) of your help LOL]. Now, from reading your post, I see why I liked it for my hair because I wet my hair before using it. When my hair was shorter, I would pour 2 cups of filtered water on my hair every other day. It was as a "final rinse" before getting out of the shower to style my hair; now, I use 4 cups. I probably didn't have the "negative" results as some because my hair had the extra moisture/water added to it. When the colder, winter months came, I didn't know too many who would want to walk around with dripping wet hair all day (I didn't mind then, but I don't like to with longer hair. It doesn't bother me as much in the summer). Currently, I realize some probably didn't want to walk around with dripping wet, sticky hair in the cold. As you can see, this got me thinking. Now, I'm off to view the post about jojoba oil and glycerin. I LOVE your site! Thanks so much for continuously sharing your knowledge and time. You are so present & available to your readers ... what love! Some of your posts raised some questions about my routine and how I use glycerin. Would you please critique my routine for my crazy, thick, 4b hair (currently TWA length)? I'd be interested in your feedback & any suggestions to help bless my hair & simplify my care of it. Thanks in advance for any info you can share. ~ Condition: Aubrey Organics, Giovanni or Yes to Cucumbers condish. Sometimes I use Giovanni Direct Leave-in (just feel in love with it). Between washings, I wet my hair with my hands or a spritz & follow with coconut oil or shea mix. Im in love with your blog! 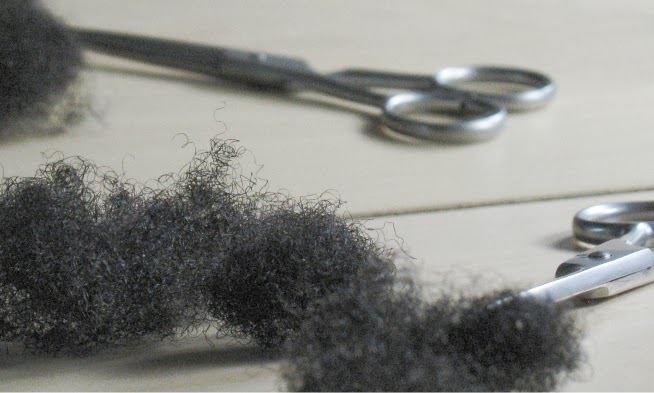 I was turn to your blog by bargainclipper's trim video on youtube and I'm so sad that I didn't discover sooner. Personally I love veg glycerine on my hair in the winter and the summer! So I've been very disappointed to hear people says its not good to use without giving a good detailed scientific explanation. As a person with a degree in biology and clinical laboratory sciences its hard for me to buy into something if the scientific claim has not been clearly and fully supported. Thanks again for your blog! Thanks Mimi - interestingly, I also cited bargain clippers trim video here! Small world! Vegetable glycerin is awesome for moisturizing my hair all year round. It's nice to know it prevents breakage as well. I'm a little confused about glycerin and dew points, which is one of the reasons I've heard of glycerin being bad in the winter or certain weather conditions (whenever evidence has been given). If glycerin attracts water from the environment then this argument would make sense. Also, if a glycerin mixture has a higher amount of glycerin to water (i.e. 1 to 3 vs 1 to 40) some of the glycerin molecules would be saturated with H20, but wouldn't there be 'free' glycerin molecules that could attach to water in the environment? I hope that question makes sense.The YT blogger that I recently began watching talks about dew points a lot, and when they are too high or too low for glycerin. But, one of her point does not completely follow for me. The too high follows, because if glycerin does indeed attract water, then your hair could get too much moisture and stay wet and/or become poofy(like in winter). But her argument for when it is too low (like in a dry summer climate) was that the glycerin allows the air in the environment outside to draw water/moisture from your hair. But doesn't the water want to go to where the glycerin is(in your hair). From what I understand glycerin doesn't form a conduit for free travel back of forth of H20. But she sites dew points as the reason for why and when glycerin works in her hair. Sorry for the long post, but recently this question has really been bugging me. Thanks for any help in this matter. I like glycerin but I have seborrheic dermatitis, so it makes my hair really soft but after about a day or 2 it makes my scalp itch with a burning sensation. I also read that humectants are not great for fine porous hair, which I have. Can you explain why this is? The burning itch and why it's bad for some hair properties. "3. Natural hair treated with glycerin is resistant to premature breakage. This means the hair will break but not as much at low levels of force. Relaxed hair does not benefit from this property (J Soc Cosmet Chem, pg 39-52, 1985). " This explains why my new growth drinks up glycerin but my relaxed hair isn't overly keen on it. Another great post! Is there a difference between glycerin and vegetable glycerin? In terms of the benefits. What shops can I get it from? As someone with extremely fine textured 4c/4b hair, I have found that the addition of a approx 15% mix of glycerin to my moisturizing oil daily spritz is the ONLY thing to keep my hair moisturized in extremely humid environments. Since I just moved from NOLA, I have noticed that I can't manipulate my hair at all without threat of breakage or knotting if this isn't in it. Wow! Just when I was going to take the glycerin out of my spritz concoction for the fall/winter months, I come across this post. My hair loves the stuff but like many others, I was under the assumption that you shouldn't use it in the winter months. Soooo, I'm going to throw that old notion out the window and keep it my spritz mixture year-round. Thanks so much for the info! Hello. I've used an activator spray that, of course, contained lots of glycerin. I LOVED it's moisturizing effect on my hair, but it made me shed more than usual during my weekly detangling sessions. Is this normal for glycerin, or could my problem be something else? I've used many other moisturizers and none have caused the shedding that the glycerin based spray caused.